Another one of those tales with the main character a relative to Sherlock Holmes. 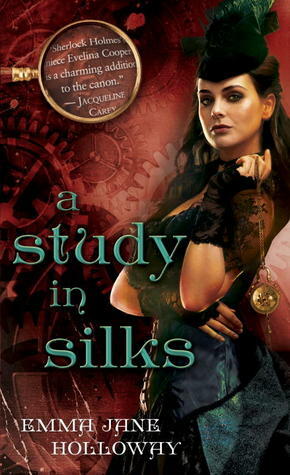 Presenting The Baskerville Affair #1 A Study in Silks by Emma Jane Holloway. A Lot of steampunk authors are concocting tales fashioned around a niece or relation to the famous sleuth Sherlock Holmes and Emma Jane Holloway seems to be one of them. But must say I actually got bored with this one. That's not to say this was a bad read. Some of it was very interesting but it suffered a lot from my perspective in some big ways. If we go by the synopsis, then Evelina Cooper, the niece to Sherlock Holmes is out protagonist of the story. But something with with differing and constantly changing POVs she gets sidelined and is not given room to flourish. Even Evelina's sleuthing skills had much to be desired for. I commend the author for trying to give her a normal background, life spent with the gypsy travelling circus and the other in English society but somehow that doesn't give her character much depth. It is good she wants to study, likes to tinker and can do magic but they don't help to cement her character at all. When you hear the term, niece of Sherlock Homes, you form the image of a somewhat female version of the detective but she somehow doesn't fir in at all. She actually concealed evidence and was very much biased towards her friend Imogen Roth's family, of the shame. Understandable for girls of that era, but still doesn't establish her credibility. The only two things I liked about this book was the romance (and that triangle) and the steampunk English setting, that part was very well done. Nut if you go by the book, then it could have been done much better if the while thing was in Evelina's POV and even that mystery lost its vigor in all chaos. "Good effort for the author but not quite there"